Doug Oberhelman, left, accepts the ARTBA Award from Pete Ruane. 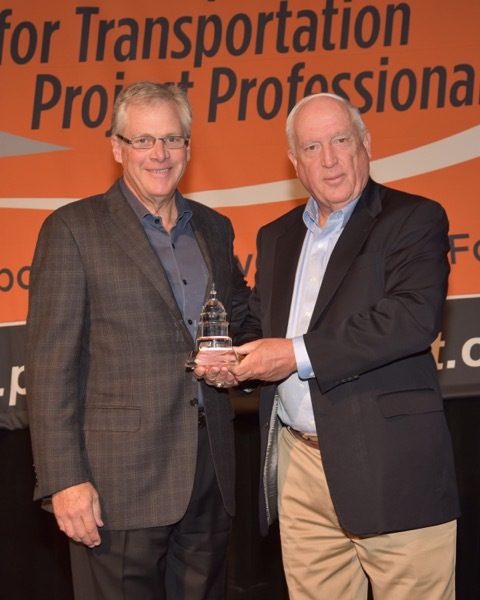 Doug Oberhelman, chairman and CEO of Peoria, Illinois-based Caterpillar Inc., is the sole recipient of the ARTBA Award, the association’s highest honor. “In volunteer leadership positions, speeches, and media interviews, Doug Oberhelman stands out as one of the business community’s most forceful and articulate advocates on the need for boosting federal investment in transportation infrastructure,” ARTBA President and CEO Pete Ruane said during the Oct. 6 presentation at the association’s national convention in Tucson, Arizona. Oberhelman’s role as chairman of the Business Roundtable (BRT) and in the development of BRT’s September 2015 report titled “Road to Growth: The Case for Investing in America’s Transportation Infrastructure” helped keep the heat on Congress to complete action on the December 2015 highway and transit law—the FAST Act. Over many years, Caterpillar has also been a key supporter of ARTBA’s advocacy and communications programs. The company’s group president with responsibility for customer and dealer support, Rob Charter, is a member of ARTBA’s Executive Committee. In addition to his legislative advocacy, Oberhelman was recognized for his distinguished service and volunteer leadership roles, including past chairman of the National Association of Manufacturers. He is vice president of the Wetlands America Trust, a member of the Nature Conservancy’s Latin America Conservation Council, and chairman of the board for the Easter Seals Foundation of Central Illinois.